When Nicholas Lambrinides served his first bowl of chili at that small hilltop restaurant overlooking the Cincinnati skyline in 1949, he didn't server it alone. He served it with a heaping bowl of deliciously light and crispy oyster crackers - the same crackers Skyline diners enjoy with their favorite Skyline dishes today, and the same crackers you can now enjoy at home. 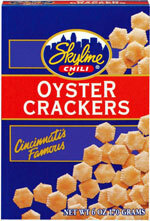 Serve them with your favorite Skyline entrée, with soups, salads, or any dish that calls for the great taste of Skyline original oyster crackers.